Red-breasted mergansers can be identified in flight by their white wing patches, long reddish bill and white neck (on males). Image courtesy Muchaxo, Flickr. In flight, all mergansers hold their bill, head, body and tail straight. Image courtesy hjhipster/Flickr. Red-breasted mergansers are very active swimmers that can swim well both above and below the water’s surface. Image courtesy marlin harms/Flickr. Female red-breasted mergansers have a reddish-brown head and neck, and a shorter crest and lighter chest than males. Image courtesy Rick Leche/Flickr. Male red-breasted mergansers have a greenish head with a shaggy crest. Image courtesy marlin harms/Flickr. Lives on shallow waters along the shoreline and tidal wetlands of the Chesapeake Bay and its creeks and rivers. Flocks are also common on open portions of the Bay and its rivers in winter. Visits the Bay region from autumn through spring, migrating to its northern breeding grounds in mid-March. 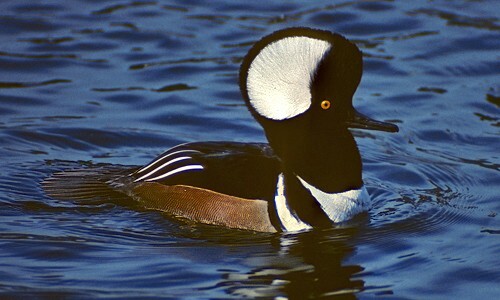 The red-breasted merganser has a shaggy crest on the back of the head and a long, slender, reddish-orange bill with serrated edges. White patches, called specula, appear on its wings. Males and females have different patterns and coloring. 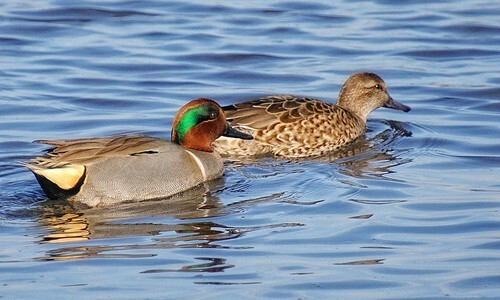 Males have a greenish head; a white collar; a reddish-brown chest; and gray sides. Females have a reddish-brown head and neck, and a shorter crest and lighter chest than males. These ducks grow 20 to 25 inches in length. Humans hunt red-breasted mergansers. Owls and red foxes may prey upon adults, while minks, gulls and ravens prey upon eggs and young on their breeding grounds. This duck takes off by running across the water’s surface and flapping its wings. They fly in a single-file line very low over the water. In flight, all mergansers hold their bill, head, body and tail straight and can be identified by their white wing patches, long reddish bill and white neck (on males). Red-breasted mergansers are usually silent in winter, when it is not breeding season. During courtship rituals, males may make a yeow-yeow sound, and females may respond with a raspy krrrr-krrrr. 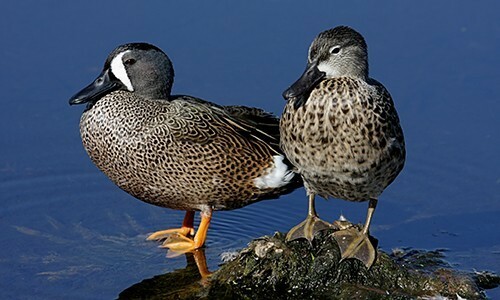 These birds do not reproduce in the Bay region, but nest and breed from the Great Lakes to the Arctic. They return to the same nesting site every year. Only 50 percent of all red-breasted mergansers are believed to survive winter and migration each year. They can live as long as nine years. Red-breasted mergansers are very active swimmers that can swim well both above and below the water’s surface. Like other diving ducks, red-breasted mergansers are awkward on land because their legs are located far back on their body. They can stay underwater for as long as 44 seconds.